Toronto blogger Veronica Cizmar runs Some Like It Vintage, an online boutique and consignment shop, which donates 10 percent of its sales to help women who have suffered domestic violence. Veronica also volunteers regularly at Toronto’s The Redwood women’s shelter. We asked Veronica to give us some tips on how to host an authentic vintage-style Christmas, and she came up with three different, but equally delightful, themes to give your holidays a timeless touch of nostalgia. 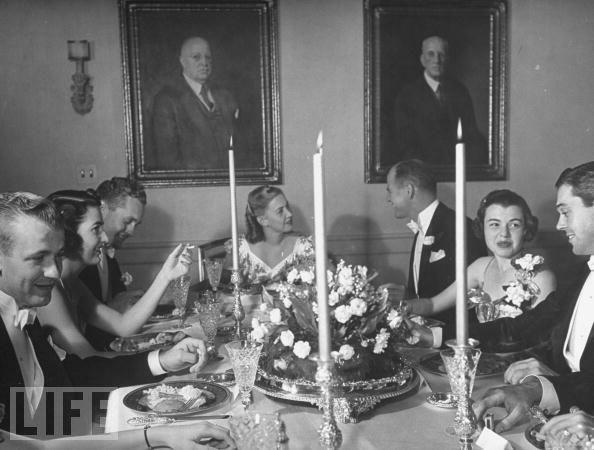 To live up to Ms. Post’s impeccable standards, polish your finest antique silverware and bring out your best Waterford crystal. Don a gorgeous 1930s evening gown or dapper tuxedo tails. Converse as if you are in a grand dining room using phrases such as, “..we’re invited to the Wordsworths’ country home”, “…skiing in the Alps this year….”, “…more champagne please…” It’s all oh-so-chic, but maybe a little too formal. 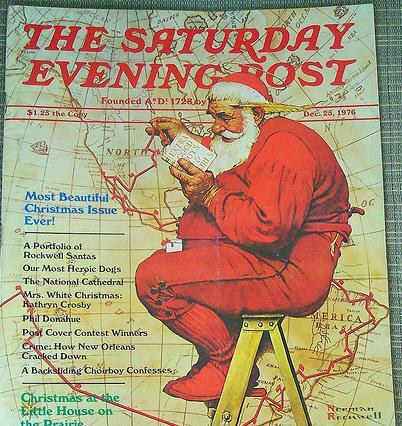 Perhaps Norman Rockwell is more your vintage style. This theme evokes warm and fuzzy feelings of Christmas carolers, sleigh rides, and Old Saint Nick himself preparing for the eve, as children write wish lists, their dolls, model trains, and wooden toys wrapped in colorful packages under the tree. Copious amounts of hot mulled cider and shortbread cookies on Christmas plates should be available for all. Living as I do in the cold Northern Canadian winters, a nostalgic holiday party would not be complete without a crackling fireplace and sitting down to watch the classic movie “White Christmas” after dinner. For your guests, this would be the time for a well-spiked egg-nog poured into vintage crystal goblets. As your guests make themselves comfortable, they’re sure to notice all those vintage lights, ornaments, and decor that you picked up for a song at the local secondhand store: The orange glow of your vintage celluloid electric Mr. & Mrs. Santa Claus set, the string of bells that are looking a little worn but sparkle in the light, or that nativity scene that is missing a wise man. Had enough of the snow and cold? Transport yourself to a sunny island. 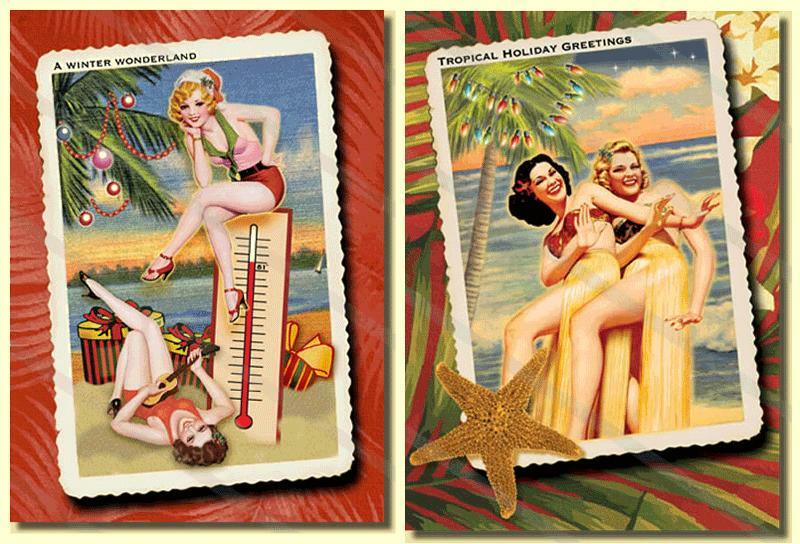 If you are into retro, a casual holiday such as a vintage Tiki-themed Christmas can do wonders for those suffering from seasonal affective disorder. Don’t forget that much of the world celebrates Christmas in a hot climate so change into a vintage swimsuit if you so desire. (Can you say “Mele Kalikimaka”?) According to Shellbelle’s Tiki Hut Blog, there are strict rules for a retro Tiki Hut gathering. Sing or play ukulele along with your Hi-Fi to an Elvis Christmas carol on a 45 RPM record. Your drinks should be in coconut shells with skewers of pineapple and tiny little paper umbrellas. Don’t forget the classic maraschino cherries as garnish! Hawaiian aloha shirts or floral dresses paired with Santa hats are the required attire. 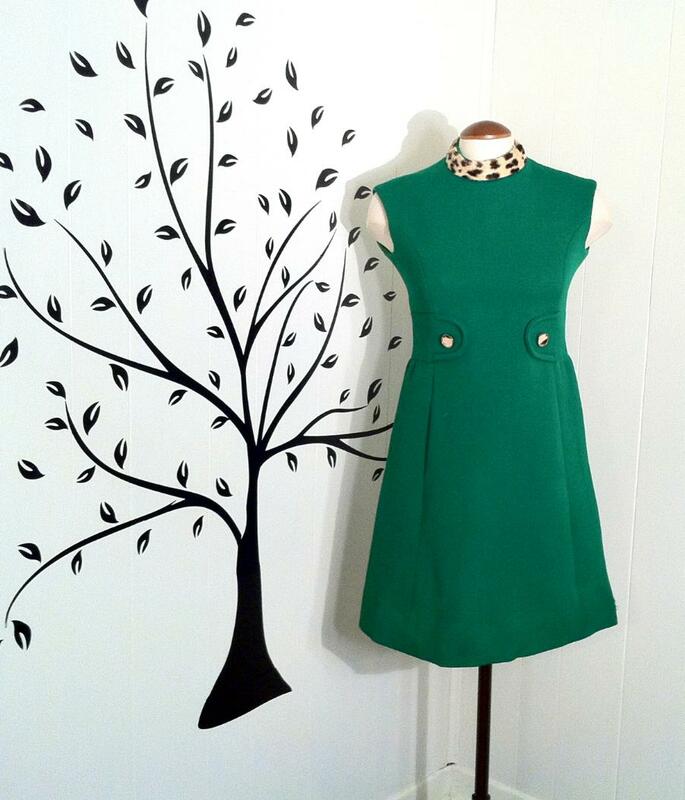 1960s green shift dress with spotted collar. Even if creating a Polynesian-island fantasy seems too out there for your family, I hope you have been inspired to add a little more “vintage” to your holidays this year. You probably already have a retro touch, just by using all those same Christmas angel and ornaments year after year (yes, even the one your kid made out of Lifesavers in third grade). Take it up a notch, and promise yourself you’ll wear green—one of the colors of the season. It’s irresistibly cheery. Or perhaps you’d prefer to wear your 1980s acrylic holiday sweater, like they do at Ugly Sweater Parties, or listen to nostalgic Christmas songs (yes, even yours, Burl Ives) on 78 RPM vinyl. However you decide to do it, may you have a very merry, very vintage-y Christmas! “ ” Tales From the Crypt’ was an amazing intro into a demented world of darkly comedic horror stories.